Do you like Bite My Fingers? Share it with your friends. 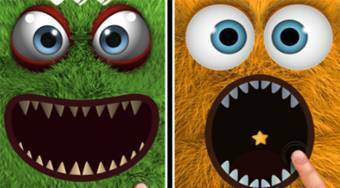 Bite My Fingers is a great perception game in which your task will be to save your finger from biting from the hairy creature. Hold your finger in the open mouth of the jagged creature and pull it out so that it does not smudge it. Collect the stars and try to upload 100 points to advance to the next round. You have three lives at your disposal and buy other types of fingers for the stars you collect.